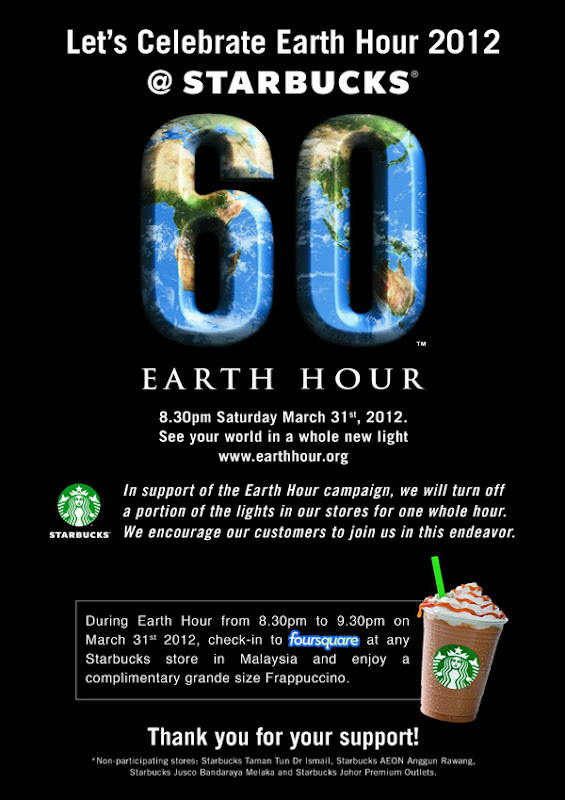 If you are at any where that has a Starbucks, GET IN THERE by 8.30pm today! If you check-in to FOURSQUARE at any STARBUCKS store in Malaysia from 8.30 to 9.30pm you receive a complimentary GRANDE SIZE FRAPPUCCINO! Please take note, though they said ANY STARBUCKS store in Malaysia, Starbucks at TTDI, AEON Anggun Rawang, Jusco Bandaraya Melaka, and Johor Premium Outlets are not participating. PS: Looking forward to celebrate EARTH HOUR here. Haha! aww man.. it'll be cool if those who are stuck in the jam off their head lights hahahah... jk.